Implementing capture software technology these days offers many new opportunities that simply were not available just a few short years ago. Just like other ‘traditional’ on-premise software applications there are now many options to develop advanced technology, yet make the user experience extremely easy and efficient. In the first of this three part series of blog posts we focused on "(User Experience/Device/Interface)" and how to properly select the most appropriate hardware capture device and also how to narrow user interface architecture based on the 'User Experience'. The point-being was to carefully consider how the technology will be used to make decisions on devices and interface instead of forcing a technology to be used in situations that might be less than optimal for the users themselves. On-premise deployment is the method which is most familiar. This simply means that the capture technology is connected to a capture device. The device could be a scanner, camera, fax machine or even image import. On device capture means that the software capture technology is embedded or part of the overall capture solution. Basically, the technology is ‘face-less’ and is integrated with some other software. Hybrid is an emerging capture deployment method which is quickly gaining popularity with the emergence of mobile and cloud computing. This method provides for maximum efficiency and typically the best performance. 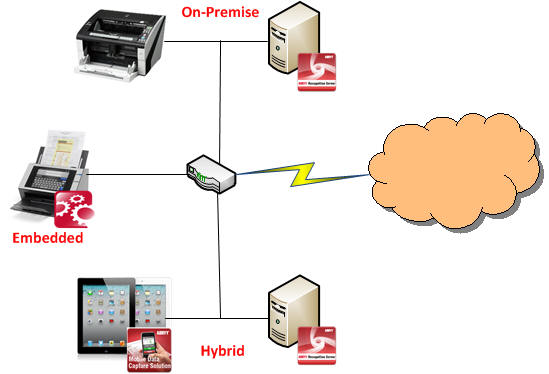 Hybrid is a system architecture that is constructed where each component performs some function in the process. Some of the interesting things that can be accomplished with a hybrid deployment method is that an application can, for example, take a picture of a document with a cell phone camera and perform image enhancement such as crop, deskew and auto-rotate on the phone itself. Then, on the server-side, perform the rest of the capture process such as classification, data extraction and export. One of the next steps in building an effective capture solution is to decide if your organization will utilize off-the-shelf software, create something custom or use capture as a service. There are many decent off-the-shelf capture applications yet all will need some degree of configuration. This type of application usage is typically for smaller, less demanding types of requirements. When customization of a software application is desired, or required, then several capture software vendors offer Software Developer's Kits, SDK's or Software Engines. SDK's are software tools that allow for software development so these are certainly not an out-of-the-box type solution but it does allow the flexibility to really customize the software application to meet specific organizational requirements. Last, but not least, is the "As a Service" option for document capture or conversion. This means that an organize would 'rent' or 'lease' these services from a provider. The 'As a Service' business model is similar to your internet service provider, cable/satellite TV provider or electricity to your home. You don't own any of those services, rather you pay for the services they provide. Read more here: Economies of scale: Cloud processing. Your choice of usage model for capture should be rather obvious but only after requirements are clearly documented and market research is done to find out what products/services are available. Capture applications installed from local media has historically been the traditional way in which most organizations integrate capture into their organization. They will download the software or install from a DVD typically and are generally more generic in their set of features. Software Developer’s Kits (SDK’s) and recognition engines are for Independent Software Vendor's (ISV's), savvy Systems Integrators or even end-user organizations to take software tools provided by a vendor to create a new application. Capture/Conversion as a Service is a relatively new concept where a users can upload images directly to a third-party hosted service for processing. This is especially true in cloud computing scenarios. In these cases the organization usually doesn't not buy the software they are using. Rather they 'rent' or 'lease' it from the vendor. This is appealing for many reasons including less initial capital expenditure, reduced time to begin using and no technical staff required for the organization. In summary, more than ever organizations are empowered to build highly effective capture solutions. With more available options this creates a vendor competitive environment which will help drive innovation, decrease prices to organizations and make advanced technology available to everyone. Legacy capture software vendors are being forced to innovate new products and services in order to remain relevant. With internet bandwidth being more and more stable as well as less expensive, it is bringing a new dimension to what, honestly, had become a somewhat stale industry. Then factor-in cloud applications which have enterprise class functionality available for organizations of all sizes to easily consume and you have a recipe to create Capture/Processing and Transformation to fit precise, not general, business requirements. I invite you to re-visit the introductory post in this series of posts on "Building an effective capture solution" by reading this post on "Capture Begins with Process". Or, I invite you to continue on by reading "Part 3 of 3 (Storage/Business Policy/Workflow)".